Last evening, Davis conquered Goliath! Traditionally I’ve grilled Pork Chops and more often than not they have been tough. them in a simple flavored liquid…and it worked! After 25 minutes in a 300 oven, they were tender and flavorful. At plating I spooned each with a Demi Glace sauce. That will be my new traditional method. 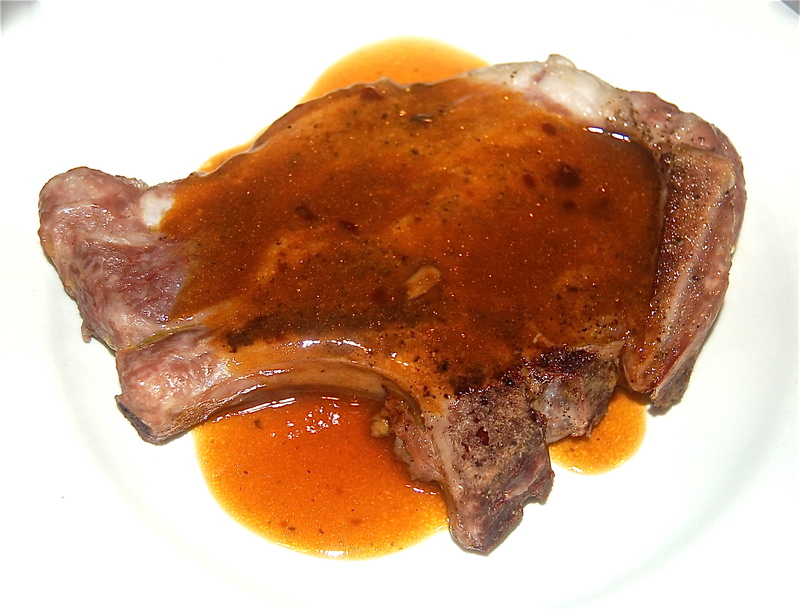 2 1″ rib Pork Chops. 2. Liberally season the chops. Add them to a casserole dish. Add the EVOO and Vermouth mixture half way up the dish. 3. Braise for 25 minutes or until medium rare. 4. For the sauce, In a small saucepan add the Chicken Stock, Demi Glace and Butter. Bring to a boil and simmer for a few minutes to emulsify.